The Drager Saver CF constant flow Emergency Escape Breathing Apparatus allows safe, effective and uncomplicated escape from hazardous environments. Simple to put on and featuring practically automatic operation, this hood-based, positive-pressure breathing device can be used with minimal training. WHEN TIME IS OF THE ESSENCE - In emergency situations, conditions can deteriorate rapidly. The air is suddenly filled with smoke or toxic fumes and rapid escape is the only available option. The Drager Saver CF is highly visible and was designed to be suitable even for people with spectacles or facial hair. When opened, the Drager Saver CF is automatically activated and begins feeding a continuous supply of breathing air. The Saver CF gives the wearer the precious additional time needed to exit the area safely. 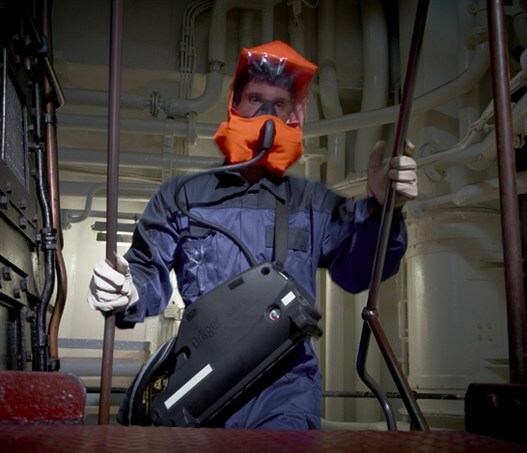 HIGHLY VISIBLE, EVEN UNDER ADVERSE CONDITIONS - Available with either a soft bag or hard case, the Saver CF can be easily wall-mounted in strategic locations in potentially hazardous areas. Both black anti-static cases or bright orange bags feature photoluminescent panels and reflective stripes for enhanced visibility, even under low lighting conditions. The Saver CF is compact and lightweight and can be warn either as a chest bag or over the shoulder. Made from highly resistant materials, it is washable, flame retardant and allows water to drain freely. UP TO 15 MINUTES OF LIFESAVING AIR - The Drager Saver CF utilizes a simple, fail-safe reducer system with excellent flow characteristics, providing a consistent rate of air flow until the cylinder is completely empty. An alarm whistle sounds before the air supply is exhausted. It can be equipped with cylinders which can hold either a 10 or 15 minute supply of air. The flame-retardant hood incorporates a large visor for maximum peripheral vision. NEW OPTIONS FOR ADDED SAFETY AND DURABILITY - The SE version includes a newly developed elastic neck seal which offers unparalleled resistance to the effects of high temperatures, ozone and diesel fumes, which are often found in places such as engine rooms. This translates to years of reliable, worry-free service, even under adverse conditions. Standard Drager Saver CF15 units can also be retrofitted with the SE option. LOW-MAINTENANCE PROTECTION - The Drager Saver CF requires very little service or maintenance. A transparent window on both the soft bag and hard case lets you check the cylinder pressure gauge easily without unpacking the unit. You know the Drager Saver CF is there for you when you need it. CONFORMS TO RELEVANT STANDARDS AND NORMS - The Drager Saver CF complies with EN1146 (2005), Lloyd's Register Certificate of Fire Approval and Lloyd's Register Certificate of Type Approval. It also complies with SOLAS Chapter II-2, the Marine Equipment Directive, the Pressure Equipment Directive and ISO 23269- 1:2008. Anti-static versions are also suitable for use in explosive atmospheres (ATEX zone 0).